After more than two decades of service to the university, Dennis Sterner, Whitworth’s founding dean of the School of Education, announced Nov. 26 that he will step down from his position on June 30, 2013. 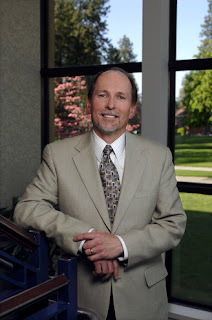 After a brief sabbatical, he will resume his original role at Whitworth as a professor on the School of Education faculty. Sterner joined the Whitworth faculty in 1988 and became the university’s first dean of the School of Education three years later. His areas of expertise include teacher preparation, learning assessment, science education and educational policy. In 1998, Sterner was awarded the Washington State Award for Excellence in Teaching Education. He also was separately appointed by Washington governors Gary Locke and Christine Gregoire to the state’s 19-member Professional Educator Standards Board, on which he served from 2000 to 2007, including five years as vice chair. Barbara Sanders, interim provost, Whitworth University, (509) 777-3755 or bsanders@whitworth.edu.